This is the chart of the USD/INR pair and the shocking rise of 10% from the first week of May till the end of June has sent jitters in the Indian economy. Imports are getting costlier and most importantly the fuel we import is getting dearer which makes the situation inflationary. But what might be the reason that RBI is not interfering in the markets now to control the dollar beast? We will explain how RBI, DOLLAR, GOLD & BONDS are all related in the moves. 1. RBI has $290 Billion in foreign currency reserves which can pay our import bills for next 7 months. 2. RBI has nearly 550 tonnes of gold in it's reserves. 3. During the crash of 2008, to revive the USA economy, FED had lowered interest rates from near 5% to almost 0.5% which has still not been raised. 1. 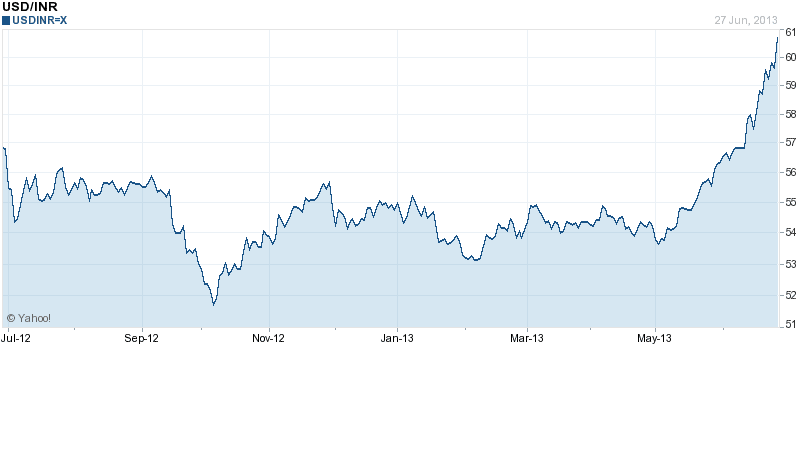 The dollar index has been getting strong and all emerging market currencies have seen a rise in dollar. This shows that the strength in dollar is indeed very massive. Selling dollar might just provide a temporary relief in such a scenario. 2. The volatility is too much to effectively curb the rising dollar. 3. The forex reserves are just sufficient enough to cover 7 months of import bills. Selling dollar now will reduce this reserve. A big amount of reserves will go into curbing dollar at this stage. Losing so much of reserves when we already have a dangerously widening Current Account Deficit will hurt our economy very badly. 4. Our gold reserves are too valuable to the RBI. The fact that they have hiked import duties on Gold shows they do not want a slump in gold prices! A rising dollar is very well contributing to supporting the bullion prices in India. RBI surely is looking forward to the gold market becoming less volatile. 5. If RBI let's the prices of gold in India to fall, there will be a mad frenzy to buy gold in India despite higher duties, which again will mean that we have to import more of gold and that will burden our CAD. SO DOES THE RBI HAVE ANY PLANS OF CURBING THE DOLLAR RISE? RBI will surely look forward to a more fundamental way of curbing this rise. It will look to attract more $'s into India. It will not only help reduce the dollar price but will also increase our Foreign Exchange reserves and narrow the Current Account Deficit. For this, it waits for the Government of India to raise the cap on FDI ceiling in various sectors and also encourage FDI in different sectors. In short, our economy has to be opened up and new reforms are needed now. As the interest rates in India started getting lower over the past few months, the prices of Government bonds started rising. And finding an arbitrage opportunity, Indian entities and investment houses borrowed dollar at cheap rates from USA, converted it to INR and invested in the G-Bonds. This happened over a period of time and when FED told that sooner or later it will start increasing the interest rates, USA G-Bonds got attractive and investors sold Indian G-Bonds to invest in USA G-Bonds. With such a huge outflow of money at once, the Indian bonds recently have hit lower circuits quite a few times and this has also sent Dollar rising. (They sell the bond in rupees, convert it to $ and run away which makes demand for $ go up).